And this little guy is Zeke, aka Zekers. He is 19 months or there about. 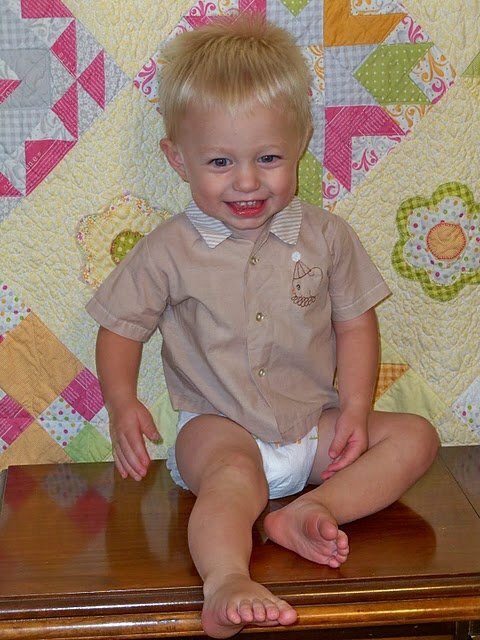 For this photo op I put him in a shirt that my hubby wore when he was a baby. He has a grin that melts my heart. His speech is exploding, so every day he has new things to share. Our latest trick is fish face. You know, where you pucker up your lips and look like a fish. Yes, I look very attractive making this face. No, I will not show you. Anyhoo, when I make this fish face, Zeke grins and leans in for a kiss and then he tries and tries so hard to make his lips do the fish face. He hasn't gotten there yet, but it's not for lack of trying. They are adorable. Reagan too! Oh, and that quilt behind Zeke is a.dor.able. !